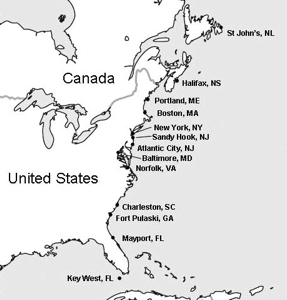 Abrupt Shift The rate at which sea level is rising increased abruptly beginning in 1987 at all 8 stations along the northeastern U.S. coast: SWPT = Norfolk; BALT = Baltimore; ATLC = Atlantic City; SDHK = Sandy Hook, NJ; NYTB = New York; BOST = Boston; PORT = Portland, ME; HFAX = Halifax, Nova Scotia. Image courtesy John Boon/VIMS. Norfolk VA Boon projects that sea level will rise by 0.62 meters relative to land in Norfolk by 2050. Note that actual sea level could be up to 0.84 meters due to monthly variability. Image courtesy John Boon/VIMS. Charleston SC Boon projects that sea level will rise by 0.15 meters relative to land in Charleston by 2050. Note that actual sea level could vary between +0.36 meters and -0.06 meters due to monthly variability. Image courtesy John Boon/VIMS. Boston MA Boon projects that sea level will rise by 0.71 meters relative to land in Boston by 2050. Note that actual sea level could be up to 0.86 meters due to monthly variability. Image courtesy John Boon/VIMS. A new study by emeritus professor John Boon of the Virginia Institute of Marine Science shows that the rate of sea-level rise is increasing at tidal stations along the Atlantic coast of North America, including those in Norfolk, Baltimore, New York, and Boston. Boon’s findings, published online in the Journal of Coastal Research, confirm those of two other recent studies that find accelerating rates of sea-level rise along the Atlantic Coast of the U.S. and Canada. He’ll discuss his research during the Oceans12 Conference at the Virginia Beach Convention Center this week, and at the annual meeting of the Geological Society of America in Charlotte in early November. The question of whether sea level is rising at a steady or increasing rate is of critical important to those tasked with planning for and adapting to coastal flooding in their communities. “Localized projections of sea-level rise are needed to guide the regional planning and adaptation measures that are being pursued with increasing urgency in many coastal localities,” says Boon. He suggests that the observed acceleration in the rate of sea-level rise for the northeastern stations may be due to changes in the strength and position of the Gulf Stream. Some climate models predict that the Gulf Stream and related ocean currents will slow down as greenhouse gases warm the planet and melting ice adds freshwater to the North Atlantic. Boon’s study comes with both cautions and caveats. He cautions that planners must recognize that future projections of sea-level rise—small or large—don’t include the month-to-month variations in sea level that can cause elevated tides and coastal flooding even under today’s conditions. Assuming that the acceleration does remain constant, Boon projects that by 2050, sea level will rise by 0.7 meters (±0.15 meters) in Boston, by 0.57 meters (±0.18 meters) in New York, by 0.49 meters (±0.27 meters) in Washington, D.C., by 0.62 meters (±0.22 meters) in Norfolk, and by 0.15 meters (±0.21 meters) in Charleston, South Carolina.